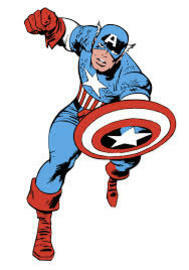 Captain America is perhaps Marvel's most recognizable superhero. Created in WW2 to be the ultimate soldier against the Nazis, Steve Rodgers was subjected to experimental scientific procedures. He came out of it at peak human condition, as the experiment improved every aspect of him, both physically and mentally. He fought in WW2 alongside his sidekick Bucky, who he would lose late in the war. After the war, Cap was frozen when he crashed into the icy waters of the English Channel, where he was frozen for decades. He was eventually thawed out, and joined the Avengers, widely known as the founding member of Earth's Mightiest Heroes. His powers are super strength, a healing factor and perfect senses. What makes him a superhero is the Super Soldier Serum that gave him his powers fortified his already indominable spirit and will. Steve Rodgers was killed shortly after the Civil War, and his wartime comrade, Bucky, took up the mantle of Captain America following that.